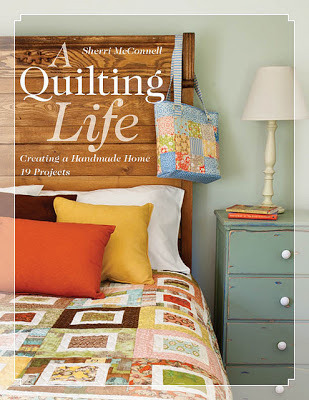 Today is my day to talk about a quilting life on my fellow C&T author and friend Sherri McConnell's A Quilting Life Blog Tour! I have long admired Sherri's blog by the same name. In fact, she was one of the first people I met at my first Market in Salt Lake City and she is every bit as sweet as she comes across on her blog! 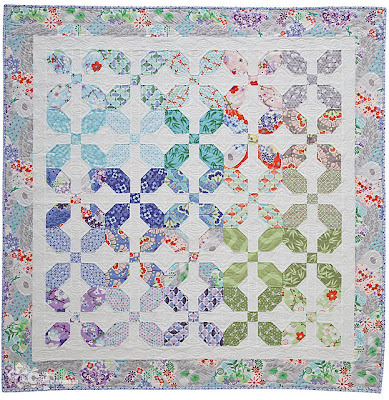 I love this quilt called Water Lily in Kate Spain fabrics! I particularly love Sherri's color placement. So... even though I am working on some magazine projects, I had to try a project in A Quilting Life. I decided to sew up the Mod Runner in Holiday Bouquet. It is such a fun pattern! My photo really doesn't do it justice but it has been raining here for the past few days and I'm indoor-photo-challenged so I had to make do. I hope you can see how cute Sherri's design is. I really had fun fussy-cutting the motifs. It was simple to piece - I did it while making dinner. About two hours before the meal, peel and slice eggplant into 1/4'' -3/8'' wedges. Arrange the eggplant slices in a colander and salt each layer - leave them for an hour. Now this is the important part... while the eggplant sits cut all the pieces for your Mod Runner! Piece a block or two! Arrange eggplant and garlic in a large casserole dish coated with olive oil. Brush the top with more olive oil. Sprinkle with basil, oregano, salt, and pepper. Put in the oven and roast for about 45-50 minutes, basting with more olive oil every ten minutes or so - don't let it get dry. Sherri's grandmother inspired her to quilt by making a beautiful quilt for Sherri's son's bed. Don't forget that you can enter any of the giveaways on any of the blogs until June 14th after which winners will be announced! Your table runner is wonderful...love the colors. I will have to say I think #1 is the lie . Great book! I think #1 is a lie. I'd LOVE to win this book---it looks so inspiring! Thanks for the recipe - it sounds delicious! Believe #1 is the lie.... loooove her book!! I think #1 is the lie, because I'm pretty sure she started quilting before that! :-) thanks for hosting!!! I;m guessing it's no. 1.....oh how I love that runner you made! Now I have to get some of that fabric! Woot! I would say #2....thanks for the chance! I have no idea which is the lie! I'll guess number 2? It's nice to know that Sherrie is as sweet as she seems on the blog - would like to meet her someday! I am gona say number 1. :) and I Love her blog!! I do believe that #1 is the lie, or at least a twist on the truth :) Thanks for the chance to win! I believe #1 is a lie. Keeping my fingers crossed - thank you for the opportunity to win. I'll pick #1. I'd love to win this book. Thanks for the eggplant recipe...we're planting eggplant in our garden for the first time this year so I saved your recipe. It must be #1. I know Sherri has been blogging since 2008 and I can't imagine Sherri not being a fan of the Irish Chain block. 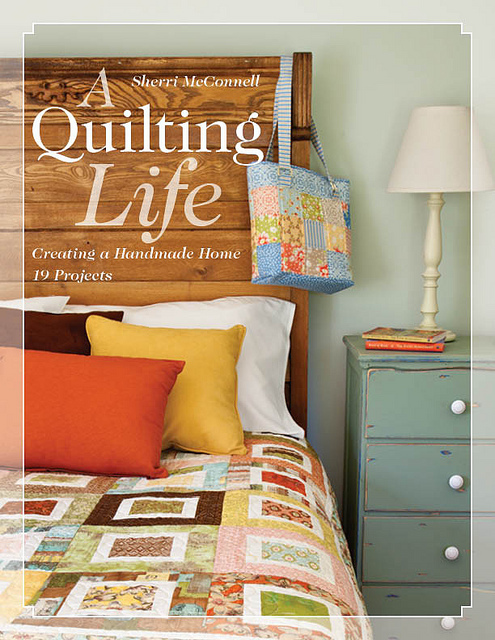 How fun to visit your blog and see your fun and colorful quilts - looks like you have a great book to check out too but thanks for the chance to win Sherri's book. First of all - I LOVE your Mod Runner...ooh, one I'd make immediately! I'll say #1, especially because Sherri's Grandmother told her "no" and had Sherri learn on her own. I think it's #1! I love all these projects I am seeing on the blogs. From a table runner to quilts to tote bags they all are great. And I will be making your recipe real soon - my husband LOVES asparagus and eggplant. Please include me in the drawing - winning this book would be awesome! #1 is a lie. I really love the table runner...very pretty. I am going to try the recipe...sounds really good. Thanks you for the chance to win this lovely book. #1 maybe--- I'm not sure... beautiful blog! #2? No idea...what a fun book, though!